Killer Characters: Wedding Bells in Cranberry Cove? Wedding Bells in Cranberry Cove? I am very particular about how Gumdrops is kept. Gerda—that’s my identical twin sister—and I make sure we’ve swept the floor and dusted the shelves every night before we go home to our pot of erwtensoep—split pea soup—that’s simmering on the stove. “Gerda, do be careful on that stepladder,” I shouted as my sister strained to reach a top shelf to straighten some jars of root beer barrels. Sometimes I get a little impatient with Gerda and I don’t mean to, but despite looking exactly alike, we are slightly different, you see. Gerda is much more given to worrying and fretting and indecision than I am. Midnight is our cat. She’s black from the tip of her nose to the tip of her tail. She keeps the shop free of mice during the day and sleeps soundly on Gerda’s bed at night. Gerda stood by the window looking out onto Beach Hollow Road. She turned to me with a smile on her face. Don’t you agree? Neither Gerda nor I ever married, but I love weddings outdoors under tents—simple and unpretentious. How about you? What would be your favorite spot for a wedding? Dead and Berried coming in May! Great title! I love that cover! I hope he proposes! I think a lovely place to marry would be in a small Historic church or chapel, with only family and a few close friends. That does sound lovely, Annette! Oh wow!!!! I never thought about Greg and Monica getting married. I think I'm a little excited! A beach wedding at sunset sounds pretty cool. But I really like that idea Hennie has put into my head, about a wedding at Sassamanash Farms. Kim, a beach at sunset sounds lovely! I went to a wedding at an art museum in the evening. That was so cool. 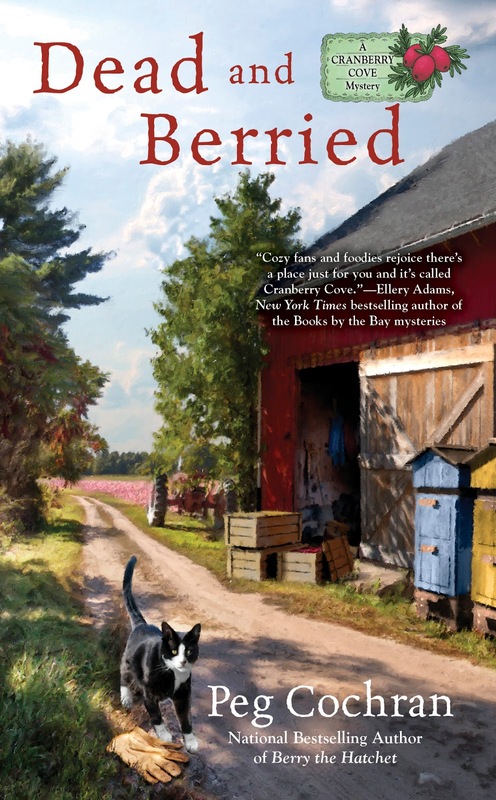 I really enjoyed Berry the Hatchet, which I bought at Barnes and Noble after Christmas. They had the first in the series but I thought I'd get the second one because I liked the cover better! Hadn't read one of your books in a while. I will be getting another one of your books (No Farm, No Foul) soon from a bargain books catalog. We have a special wild beach called Seascape beach. Its expansive and has white sand. It has a bluff overlooking the bay and If anyone marries me again (big if over 60!) I have always wanted to get married there and have photos taken down in the water. They even have a neighboring resort that sets up on the beach for receptions. ! I adore this series and cannot wait to read of their marriage on the farm, it would be perfect cozy bliss for this reader.